The study of plant galls is called cecidology , which means the knowledge of galls. The history of cecidology goes as early back as classical antiquity (BÖHNER). It is not simple to define 'galls'.A gall is an abnormal growth produced by the host organism in response to the presence of another living organism . In this, we distinguish zoocecidia, induced by cecidozoa and phytocecidia, induced by cecidophyta. This means the galls are caused by animals or plants and fungi respectively. It is important to know whether the growth occurs in the absence of the thought gall agent, as a gall should be induced by the gall agent. This rules out abnormal growths due to mechanical damage, or unusual environmental properties such as light, temperature, nutritional deficiencies and toxic chemicals. The gall agent usually is closely associated with the gall and the host. It often makes part of an important part of the agent's life cycle.There is great difference of opinion whether the enlargement and/or proliferation of the plant cells is necessary if the growth change is to be called a gall. By some, reduction in mature size is an acceptable requirement. In some cases the host tissue develops with an internal structure differing from that which would normally have occurred, but often similar to that of other parts of the plant. In some cases the gall is colored differently from the unaffected parts of the plant. In all cases, the gall is supposed to provides shelter and food or nutrients for the gall agent. The gall growth is initiated and regulated by the gall agent. 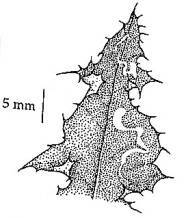 The requirement for regulation may exclude the leaf-rolls ofBlennocampa phyllocolpa on rose, which may be due solely to a chemical agent introduced at the time of insertion of the ovipositor. Such effects are referred to as 'procecidial'. The gall location, size and shape is very specific for that gall causer on that host. But there is no rule for all agents. Diversity is nearly to great to grasp and so is their behavior. In some cases the same species produce different gall types in different locations on the same or different hosts. These can be algae, fungi, lichen, mosses, liverwort, ferns, conifers, trees, shrubs and herbs. Most of them are found on trees, shrubs and herbs. 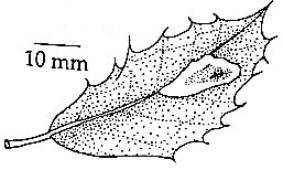 Galls can be found on every part of a plant, but they are most commonly found growing on leaves. Certain gall wasps make an oak to produce gall apples, likeAndricus species. In these ball's and marbles tannic acid is present. With this tannic acid people were able to make ink (dark ages and centuries before) when it was mixed with iron salt. In The Netherlands, Andricus quercusfolii was used for this purpose.